NEW YORK CITY (WABC) -- After running nine marathons myself, I had the special assignment of running reporter along the course of the TCS NYC Marathon 2017. My first interview was with 70-year-old Kathrine Switzer, the iconic woman who became the first female to officially finish the Boston Marathon back in 1967. She went on to inspire generations of female runners, and Sunday was no different as she ran with her foundation called 261 Fearless. She and her crew were chanting 261 Fearless all along the course, and spectators quickly joined in with a chant. Another woman had a historical moment, as 36-year-old Shalane Flanagan became the first American to win since 1977 with a time of 2:26:23. Related: Find Your Finish! 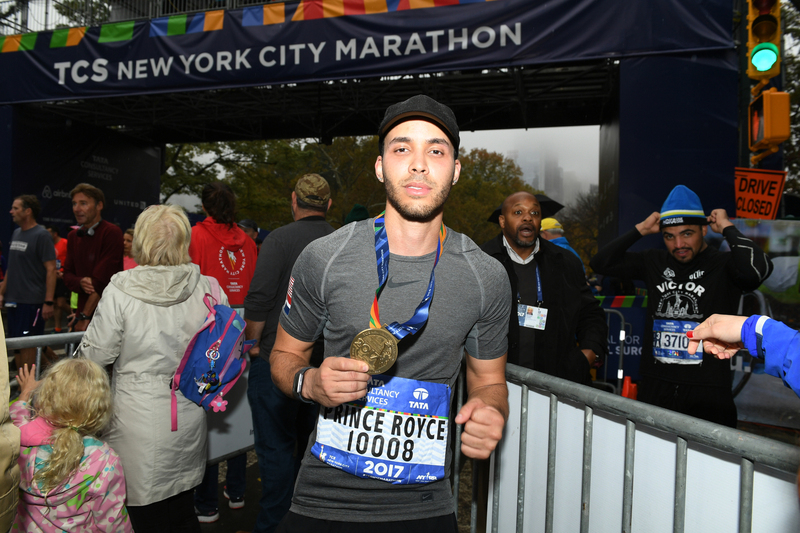 Watch runners cross the line in the 2017 TCS NYC Marathon! I interviewed the four-time Olympian last year, when she was an ambassador for the marathon. She took a break to recover from an injury following the Rio Olympic games, which she said was the best thing that's ever happened to her. The rest allowed her a huge recovery that she had not had her entire running career. When I saw her in August of this year, she was participating as a Team for Kids ambassador at "Run for the Future" up in Harlem. She said her training was just getting started, and she really looking forward to the race. On Friday night at the Parade of Nations, she was part of our Channel 7 broadcast of the opening ceremonies. She talked about her second place finish in 2010, which was her very first marathon. All three runners who were on the podium that race in 2010 were back this year to run again, and Flanagan said she was prepared and confident going into the race -- with a little fire in her eyes. Her emotional victory was inspirational to anyone watching. --Camille Ake, 21, who ran for New York Cares. She's been diagnosed with social anxiety and OCD, which made adjusting to NYU very difficult for her. She took up running through the Achilles Organization, which she said allows her to push pause on her symptoms. She finished with a time of 5:56:41. --Stuart Fisher, 66, had not run since he was 15 years old before last year. Inspired by his two daughters and motivated by the needs of his two nieces who have rare disease disorders, he decided to run the race raising money for the National Organization for Rare Disorders. When I saw him in Queens, his daughter was just a few seconds ahead of him. He was in good spirits, saying that it's never too late to do the things you want. He finished in 5:33:12. --Supermodel Karlie Kloss said she used to hate running. Then she took a challenge and ran the Paris Half Marathon with her friends. 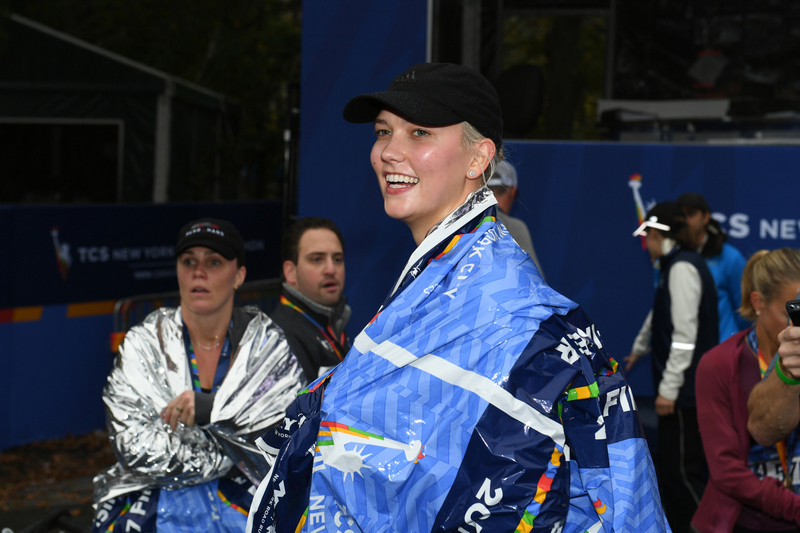 She was hooked, and she created a foundation called Kode with Kloss that led her to her her first NYC Marathon. Her Foundation empowers girls to take up tech. New York Road Runners coach Jon Honerkamp ran with her group, and he said it was a great race. --Leukemia survivor Bishoy Tadros was the second highest fundraiser for the Leukemia Society's Team in Training program. The organization began fundraising in 1988 through running and has led an entire movement in fundraising for charities over the last 40 years. Tadros told me that running a marathon symbolizes breaking barriers, which has helped people like him and others survive their disease. He ran the race in 4:41:03. --Drew Swiss, vice president of finance for Montefiore Medical Center, raised $75,000 for Team For Kids. The father of four has run 30 marathons, but New York City his favorite. I saw Drew on First Avenue with a huge smile on his face, and again leaving Brooklyn into Queens and in Manhattan closing in on the last six miles. He was still smiling. His time was 4:51:04. --The first couple of sports, Ashton Eaton and Brianne Thiessen-Eaton, also ran the marathon. They are national ambassadors for Team in Training, which is considered the first organization to create charity running at the New York City Marathon back in 1988. I saw their group running for Team in Training in Brooklyn. Both of the Olympic athletes looked strong. Brianne said running through the streets of New York was thrilling, and Ashton said they are proud to be with an organization that has raised $1.5 billion since 1988 for fighting leukemia. --Brooklyn native Amy Stone ran for a cause called Extreme Kids and Crew. Her twins were born prematurely at 28 weeks and have health complications. They were her inspiration to run the race, at 44 years old while going through divorce. Running a marathon makes everything else seem easier. She finished in 5:12:34. 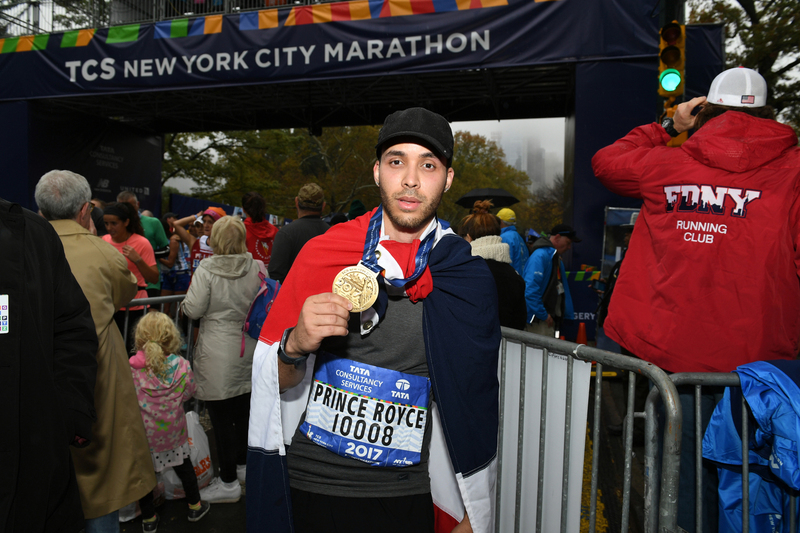 --Several celebrities, including Kevin Hart, Carole Radziwill, Prince Royce, Candice Huffine, Daniel Humm and Tiki Barber, also crossed the finish line. 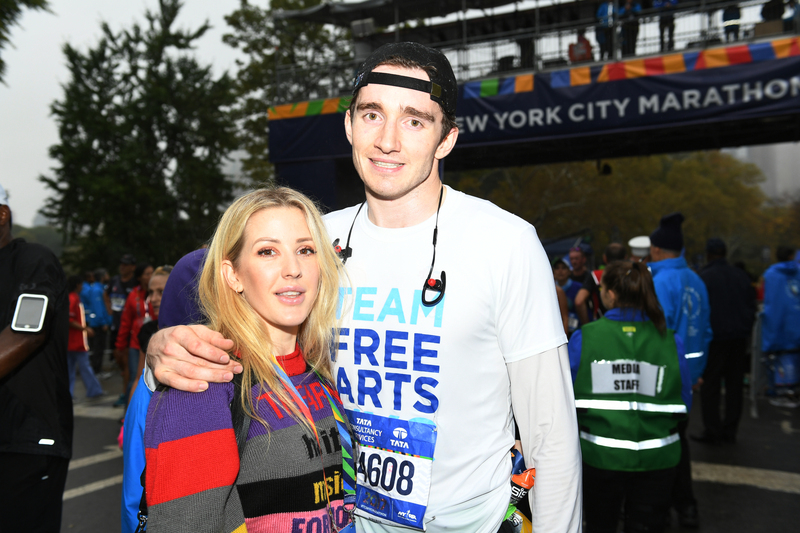 Additionally, Ellie Goulding made a surprise appearance to meet her boyfriend, Caspar Jopling, at the finish line to hand him his medal.